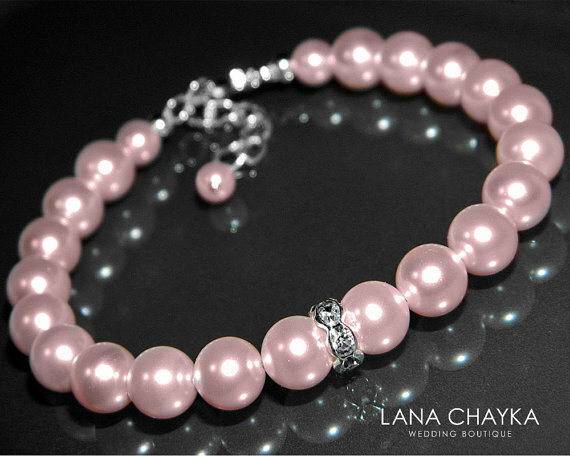 Wedding Swarovski Rosaline Light Pink Pearl Bridal Bracelet. Classy and elegant wedding bracelet has Swarovski Rosaline round crystal pearls, 925 sterling silver end component, rhodium plated lobster clasp, silver plated spacer bead with clear crystal rhinestones, silver plated findings, and bead stringing wire. Bracelet is about 7.25 inches (18 cm) long plus 1 inch extender chain.